Trimble Outdoors , Wikiloc, and EveryTrail have created great layers in Earth to explore trails in 3D. But how can you get your own trail information into Google Earth from your Global Positioning System (GPS) device? With Google Earth 5.0, you can now import GPS track information directly from your GPS receiver, quickly and easily. This functionality was previously only available to Google Earth Plus subscribers but is now available to everyone. GPS receivers that record your position over time are increasingly commonplace. Backpackers often carry units that provide their position on a map while they hike; cyclists and runners wear units on their wrists that can record heart rate and wheel cadence information; and drivers can record frequently visited places and their journeys. Using the GPS import feature in Google Earth 5.0, it is now easy to see where you've been. Telling someone that you're tired after a hike is one thing, but replaying that hike in context of elevation change and the surrounding terrain helps deliver the story of your adventure. Say you're going on a family climb of Diamond Head in Hawaii. If you bring a GPS receiver along, you can replay the experience. 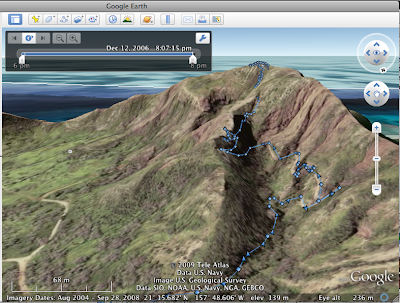 I did when I made this hike with my son, and now you can use Google Earth to replay the climb with this KML file. The replay clearly shows our pause at the entrance sign where we stopped for the photograph in the family album, the geocache we discovered at the top thanks to the GPS, and lets us remember going through the tunnel of 175 steps when we lost view of the satellites and the line disappears on the map. Whatever your adventure is, you can see it easily in Google Earth. Here's an example of a drive in Yosemite National Park while I was vacationing with my family over the Fourth of July holiday. You can see our drive past El Capitan - down to the dead-ends and the sight seeing stops - and even animate the winding roads and the walk at Half Dome using the Touring feature while seeing the roads in full 3D context. 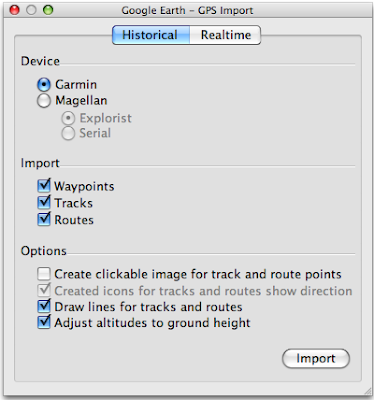 Once you've returned from your adventure, getting the data into Earth on Mac and Windows is as easy as plugging in cable from your GPS (typically USB, but sometimes serial) to your computer. In Google Earth, use the Tools->GPS menu to import the data. Over two hundred GPS receivers are supported, including most outdoor models from Garmin and many models from Magellan. Many more models are supported in NMEA mode for realtime positioning of your location in Earth. We've included the KML files of these trips for you to explore. Click on any point to see motion and position information. Use the new time controls to animate the hike up mountain; see how long it took me and my son to make the climb. Soon you'll be telling your own locationally-aware stories. Google Earth 5.0 adds support for over two hundred GPS receivers - nearly fifty more than in Google Earth Plus 4.3 - to bring in your tracks so you can add photos, animate into movies, and otherwise help share your stories in the context of the surroundings. 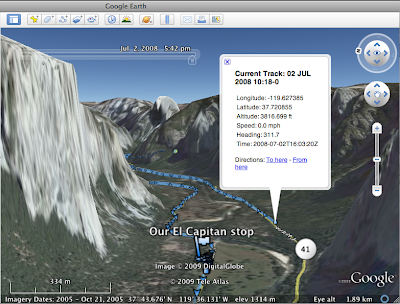 Google Earth is a great tool for sharing stories about your favorite hiking, biking, and running trips. Partners such as Trimble Outdoors , Wikiloc, and EveryTrail have created great layers in Earth to explore trails in 3D. But how can you get your own trail information into Google Earth from your Global Positioning System (GPS) device? With Google Earth 5.0, you can now import GPS track information directly from your GPS receiver, quickly and easily. This functionality was previously only available to Google Earth Plus subscribers but is now available to everyone.